I spent two days in London, and the combination of exhibitions, outlook and walking around London formed a perspective-shifting whole. This, admittedly long, text combines an overview of each exhibition (with an emphasis on elements that are important to my practice rather than attempting to give an overview of the whole – which I would normally attempt to do) and a critical interpretation of different elements of the trip. Unless stated the references for the following images are the works themselves and short paragraphs of text in the exhibition. Jasper Johns : Something resembling truth. I should start off by saying - what a wonderful title. A subject Johns has explored throughout his prestigious career, truth is a tricky thing to explore effectively. I can honestly say I didn't realise what a master of this Johns is until I saw this exhibition. The careful curation and interesting collection of works form a whole that explores our understanding of truth in painting and visual culture. An exhibition covering the career, including very recent works, of Jasper Johns. I have researched Johns’s work in previous years, but I can now attest that it was never with the detail I should have. One positive result of that is that many of the works in this exhibition came as a shock, and I spent a great deal of time in the middle section of the exhibition, as it had the most correlation with my work and the works I felt most connection with. The exhibition was arranged chronologically, but each room was a thematic exploration of his work. Johns’s career can be described to have followed a thematic development, there are clear areas of interest at particular times in his life. In the exhibition, the curators brought works from varying time periods together when the themes aligned. As I walked around the exhibition I made a few notes of pieces to articulate at a later date. There are far more interesting things about the context of these works, but these are a few that stuck out to me. ‘Numbers’ (2008) This piece was a large re-creation of an older work, cast in metal. The reason i made note of this piece was the footprint in the top right corner, which was made by Merce Cunningham on the original. This directly references the original site of creation. ‘Target’ (1961). This piece is one of the first seen in the exhibition, hung opposite the entrance. It is an iconic piece, a recognisable form repeated often through John’s work. The most striking thing, for me, when seeing this piece in person is the depth of the collage beneath the encaustic paint. This detail cannot be seen in reproductions of the work, and in reality, the eye is drawn around the work. The image is a target, designed to draw the viewer into the centre, but the way John’s has painted the work draws attention away from the centre point. Hidden reality. One of the first rooms was inhabited by work done by Johns based on the number 0-9. He treated these images as symbols, separate from the meaning that we apply to them. (Jasper Johns : Something Resembling Truth, 2017) One drawing overlaid the numbers over each other, creating a semi-recognisable form that balances fiction and nonfiction. Johns reduces and expands the meaning of these symbols and highlights that they are in fact symbols representing something else. Jasper Johns (1960) Disappearance 1. Encaustic and canvas collage on canvas. 101.6 x 101.6 cm. ‘Disappearance 1’ - This piece marks a shift in John’s style, with no recognisable elements on the surface. (Jasper Johns : Something Resembling Truth, 2017) I was drawn to it for the collaged canvas placed into the lower section of the work. Paint covers the entire surface, and from a distance the second layer is harder to spot, but close up the corners of the collaged canvas curl and distort, adding literal depth to the illusory surface. The additional canvas alludes to something further hidden, obscured from view by the act of this ‘patching’. Jasper Johns (2002) Study for a Painting. Encaustic on linen and wood with metal and string. 160.7 x 198.8 x 15.2 cm. Study for a painting’. This piece is one of a series exploring John’s interest in ‘cantenary's’, (Jasper Johns : Something Resembling Truth, 2017) which is a word describing the curve created when a piece of string (or another length) is suspended from either end. A natural curve the strings are hung slightly in front of the canvas, bringing the literal space of the painting into the work in a subtle and effective manner. The strings move slightly as people move around the gallery and the shadow cast on the work constantly moves. I found both the imagery of the catenary and the execution of this idea beautifully and simplistically complex. 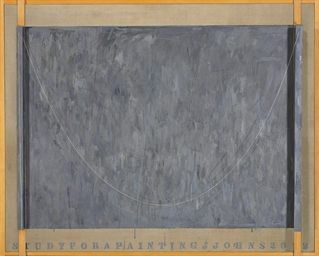 Jasper Johns (1960) Painting with Two Balls. Encaustic and collage on canvas with objects. 165.1 x 137.2 cm. 'Painting with two balls'. Three large rectangular canvases are bolted together, a feature that recurs through Johns work form a large, colourful canvas. The top two are shaped to leave an elliptical gap between them, where the artist has placed two painted balls. This work balances a painterly aesthetic with a direct challenge to the nature of paintings as objects. The viewer can see the walls of the gallery through the work, and the two balls rely upon the objecthood of the stretcher frame to exist in their location. This piece was one of the first that exemplified John’s talent in merging content and context, into a single piece that both challenges and enthrals. Jasper Johns (1956) Canvas. Encaustic and collage on wood and canvas. 76.3 x 63.5 cm. ‘Canvas’ - The only feature on this canvas is the addition of a stretcher frame on the surface, which is then covered in an equalising collage - each piece is the same shade, almost the same size and with no recognisable features. John’s creates a clever visualisation of the hidden reality of a painting. Paintings, traditionally considered, cannot exist without the stretcher that forms them, however this vital element is hidden, and in Modernist theory not part of the painting at all. John’s directly challenges this idea in this piece. With no other forms on the surface this piece articulates its message well. 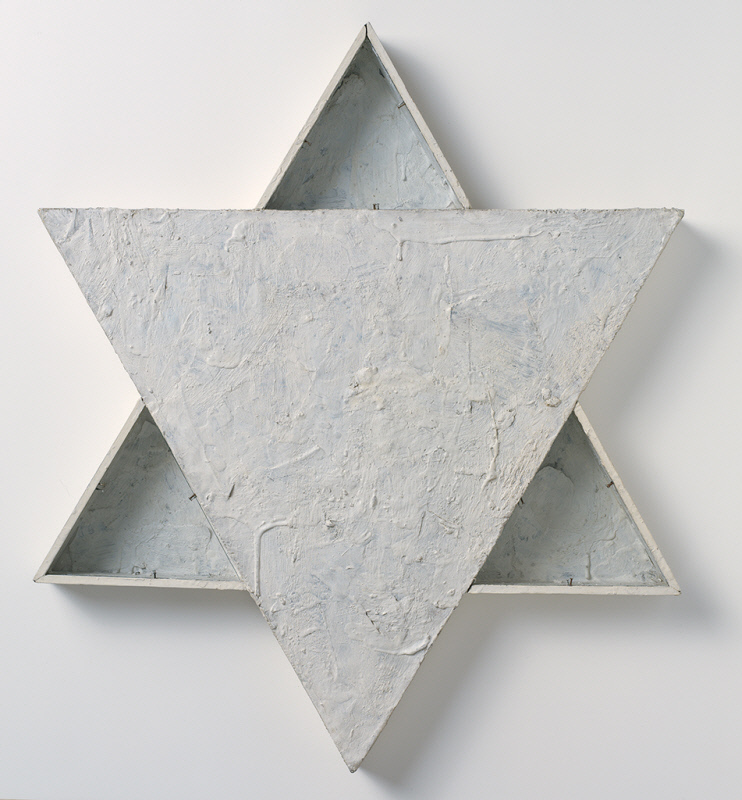 Jasper Johns (1954) Star. Oil, beeswax, and housepaint on newspaper, canvas, and wood with tinted glass, nails. and fabric tape. 572. x 49.5 x 4.8 cm. ‘Star’ - The subtle connection in this piece is almost impossible to appreciate second-hand. In three of the points of the titular star, Johns has placed glass fronts, echoing a picture frame. The entire object is shown inside its own white frame, without glass. To me this interaction subverts traditional ideas of framing, and what is and is not part of the frame/work. The glass is polished, when combined with the white frames this has the effect of hiding the glass, until a light reflects off it - which was what drew me in for a closer look at this piece. The ruler, and the colour grey, became a common tool and theme for Johns. (Jasper Johns : Something Resembling Truth, 2017) The inclusion of the ruler into the work speaks to the illusion of depth in painting. In this piece in particular, with the ruler mounted above the surface, hinged in the centre of the painting, the work appears to speak about illusion and depth. The literal size of the painting, which leads towards the illusional depth in traditional painting. Jasper Johns (1961) Painting Bitten by a Man. Encaustic on canvas mounted on type plate. 24.1 x 17.5 cm. ‘Painting bitten by a man’ - Another clever subversion of painting. The surface is made of clay, not paint, and yet the title leaves no doubt in the viewer's mind that they are in fact looking at a painting. The surface is marked by a single form, that we cannot help but recognise as teeth marks. Questioning our ideas of what constitutes a painting as well as ideas of authorship (those were not John’s teeth (Jasper Johns : Something Resembling Truth, 2017)) this piece made me smile in a very honest appreciation of a great work of art. Jasper Johns (1963-65) Skin with O'Hara Poem. Lithograph. 55.9 x 86.4 cm. 'Skin with Ohara poem' - This piece has an inked imprint of the artists face, spread across the surface, forming a distorted representation that is no less real, and arguably more so. Looking at the work I couldn't help but mentally picture the action of the artist, which is an odd form of passive aggression. Jasper Johns (1967) Harlem Light. Oil and collage on canvas (four panels). 198.1 x 436.9 cm. 'Harlem light' - This piece extends the reality of the work by challenging the rectangle. The subtle addition, or redaction depending on your viewpoint, draws attention to the shape of the work, and the regularity of the right angle. 'Field Painting' 1963-64. Oil on canvas with found objects. 182.9 x 93.3 cm. The piece is two vertical canvases, which together form a single whole, with metal letters intersecting the two. The metal letters become part of the painting while turning it firmly towards sculpture, and the line between the two (pun probably intended). The letters spell out the primary colours, which are painted onto the canvas, forming painted ‘shadows’ of the words. The top letter, an ‘R’, is a red neon light, casting its own shadows in opposition to the painting, yet highlighting the illusionistic qualities of painting itself. The tools of making are attached to the metal lettering, using magnets. The magnets and the neon light echo the dynamic brushwork, a feeling of energy combined with a literal representation of it. Found objects are used regularly in Johns work. He was fascinated by the notion of the everyday, and it's implications in art. (Jasper Johns : Something Resembling Truth, 2017) The inclusion of the everyday in art highlights the intrinsic link between art and life while referencing the process of making, and nomination. Johns interestingly works with an expansion of the two dimensional into three but visa versa in many works. The reality of painting as object is a tool he utilises well. Jasper Johns (1982) In the Studio. Encaustic and collage on canvas with objects. 182.9 x 121.9 x 10.2 cm. A painted plaster arm and a length of thin wood (with connecting string) adorn the surface of this painting. The painting shows the inside of Johns studio, with a representation of another work on the right side of the canvas. The plaster arm hangs in the centre, presented for viewing. A painting of that arm forms the foreground of the work, superimposing the viewer as the artist, as if the viewer is standing exactly where the artist stood, while painting a painting of a plaster arm. The work is a skillfully executed conversation between viewer and process. The plaster arm is painted with colourful tessellated diamonds, which directs the viewer not to think of this as something grotesque but as a tool in the artists' world. Aesthetically I felt that the piece is missing something, the composition doesn't feel balanced in a way some would call ‘right’ and yet the work speaks to the viewer at another level, and the slightly jarring compositional effects enhance the space within the work, and more importantly the viewers' relation to it. Jasper Johns (1974/75) Corpse and Mirror II. Oil on linen (four panels), with painted frame. 146.4 x 191.1 cm. 'Corpse with mirror' - Johns became fascinated by the symbolic form of the cross-hatch upon viewing it through a car window. John’s said “I only saw it for a second, but knew immediately that I was going to use it. It had all the qualities that interest me—literalness, repetitiveness, an obsessive quality, order with dumbness, and the possibility of a complete lack of meaning.” (Painters Painting, 1973) It also shows that brush marks in different paintings and images that have different meanings. It’s not just the marks but their relationship with their surroundings that makes meaning. The reading is different depending on context. The marks are arbitrary, what gives them meaning is their relationship to their surroundings. This piece is a series of dark cross hatches that are interlocked over a white surface. What drew me most to this work is that Johns has continued the painting onto the interior of the frame, directly linking the two in a way the viewer cannot ignore. I would be tempted to argue that this subtle manipulation of a relatively traditional painting encapsulates two of John's main interests - painterly aesthetics (and the context therein) and the reality of the painting object. Jasper Johns (1962) Fools House. Oil on canvas with objects. 182.9 x 91.4 cm. ‘Fools house’ - This piece has the unique quality of being reproduced larger than life on a banner outside the RA. It adorns all advertising about the exhibition and as such has gained a spike in existence, for a short period. It's not hard to see why this piece was chosen, it fits perfectly with the exhibition's title. 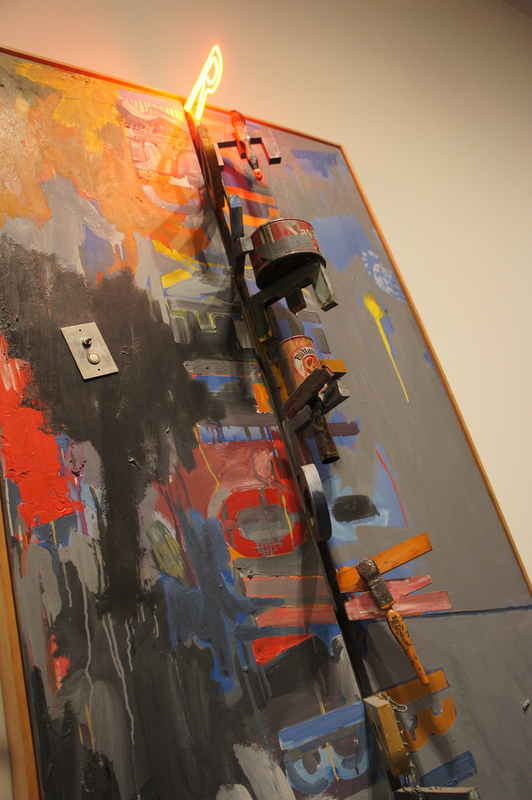 As with the other paintings in this room, Johns combined found objects with painterly process. In this piece, the main focus is a broom, used as a paintbrush. The use of what is basically an oversized paintbrush is a vivid association which Johns combines with the implicit action of the artist in the brushstroke and paint hardened bristles. The colour palette is refined and shows a harmony between object and paint. This piece, and the others in this space twist the purpose of everyday objects. Using teacups as an artistic tool and then as an element in ‘Art’ itself challenges our understanding of the purpose of these objects. The use of them in painting questions the nature of representation and reality. Jasper Johns (1960) Painted Bronze. Painted Bronze. 34.3 x 20.3 cm. This is a sculpture, of a coffee can filled with paintbrushes, reproduced in bronze. This labour intensive task, to create something that already exists and is overlooked in its banality, is a brilliant visualisation of the nature of art; as a way to explore the reality of visual language. This work questions our understanding of what is true and what is false, we are left wondering which one is art, and why. Johns interests have shifted through the decades to a more introspective field. (Jasper Johns : Something Resembling Truth, 2017). His early works attempted to disassociate his emotions and feeling from the works. As he got older his rigidity in this stance lowered somewhat. 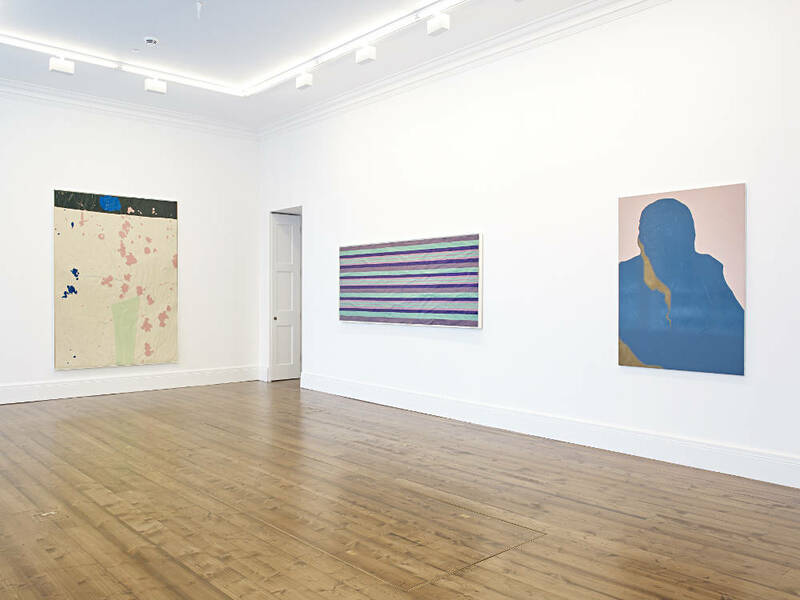 A series of four paintings, ‘summer’, ‘winter’, ‘spring’ and ‘fall’ are allegorical works that explore the artist's life and the human condition. John’s interest in the human form is hardly new in his work, the inclusion of plaster body parts, inspired by a visit to Madame Tussauds, (Jasper Johns : Something Resembling Truth, 2017) speaks to an interest in the human in relation to art. These works are full of metaphor and allusion and are quite stunning things to explore and understand. A single important element that I found visually arresting are the painted hands included in ‘Summer’ and ‘Fall’. In both a handprint forms the representation of a hand, the arm is a blocked line that continues from the edges of the print. Neither of these things is a hard or an arm, and yet we read both as such. John’s combines these with an arrow, symbolising movement through the careful application of symbols. I made a few notes about certain works being next to each other, and have subsequently not been able to find images of the works in question. This exhibition was brilliantly curated, and while the possibilities of curation are almost as far reaching as the possibilities of art, there were some insightful connections between works of disparate times. I have a single image of the sort of connections I mean (below) in which we see a physical work with a cantanery, next to a sketch of one (done years earlier) with a painting of one. Each of these iterations forms a conversation from a slightly different perspective and the relation between them in this exhibition serves to highlight the artist's intention and the meaning attributed to the works. The following is a note I made that I have been unable to place. ‘Screen piece 3’ alludes me. This is one of the problems of not being able to take photographs of works and yet having no catalogue of them without purchasing one. While this text is formed of a few notes and thoughts it's shear word count and importance to my practice leads me to want to write a conclusion of sorts. Johns clever use of semiotics is part of what makes his works so complex. The pieces speak of things we already know, making us question our own perceptions. I cannot currently sufficiently articulate the importance of this exhibition. I can see myself in alignment with Johns (although obviously at very different levels). Johns was concerned with a different subject, albeit a linked one, and his ‘style’ is skillful, unique, and undeniably painterly where I work with installation, yet the way he works, the way he views art and, especially, the brilliantly executed works in the ‘painting as object’ room, are something I can honestly say I aspire too. The medium and message are balanced brilliantly by an inspirational artist. This exhibition was in a much smaller gallery, with far more sculptural elements, which made the rooms feel far more crowded and moving around a collaborative experience. Each ‘object’ was surrounded by sketches, tests, paintings and collages, creating implicit connections between inspiration/subject and artwork. Being able to see these connections gave the viewing of this exhibition more of a museum-like quality. Many of the things we would consider artworks were not alone on a wall, waiting to be contemplated. The reading of them was directed towards a comparison between object and representation. The process highlighted through the viewing of the works. The objects themselves are not only revered by the artist in his creation of work but by the curators in the creation of this exhibition and the collectors who have archived them. Duchamp has long been an interest and influence of mine. I have seen his work in various places over the years. I am in the process of pulling together a text about the importance of his works, especially ‘readymades’, and the implications in terms of nomination, deskilling and the everyday, so I won't go into great detail about these things here. This exhibition explored and presented the friendship, respect and mutual admiration of Salvador Dali and Marcel Duchamp. (Dali / Duchamp, 2017) I found the exhibition extremely interesting, for the relationships between the works of these vastly different men. The rooms were ‘shared’ between the two artists, with works shown with relational significance to one another. Many of Duchamp’s cubist paintings were in the first few rooms of the exhibition. In the penultimate room was a large cabinet containing a variety of sculptural works and texts, the majority of them by Duchamp. Amongst other readymades, images and objects sat ‘Fountain’ the iconic readymade of 1917. It isn’t the first time I’ve seen this work but once more I am struck by the shine on the surface and the fragility of the material. A short background - this piece was ‘found’ by Duchamp in a shop window, it was commercially available at the time. He entered it into an open exhibition in 1917, and it was denied. (Dali / Duchamp, 2017) Duchamp argued that it was the choosing and nomination of the object, the additional paint added seems to be almost irrelevant in this argument, by an artist that defined this work as art. (Dali / Duchamp, 2017) The fact that it was an everyday object, that someone could walk to a shop and buy the same thing Duchamp did, was an important fact in its creation and importance. In all honesty, seeing the work is best described as disappointing, but the interesting thing is the reason why. The work is no less important for the viewing of it but in this case, knowledge causes the viewing to be diluted, and I am sure I'm not alone in that stance. Knowledge allows the understanding that the piece behind this glass is a replica. (Dali / Duchamp, 2017) The original was destroyed and the manufacturer no longer made that model. Due to its status, the ‘artwork’ was reproduced and there are now four in existence. This quartet of physical reproductions can be compared to an image in a book. That is not to say that there is no difference between seeing the image of this work on a screen/paper and seeing it in person but there is certainly a change when knowing the reality of the object in front of us. Its original context was reliant on the nature of its creation, manipulation and nomination by the artist. This object represents that idea and that work, but it is not it. I suppose there is an argument that the reproduction of this object, on the grounds of its status as a masterpiece, turns it into something else. In the same cabinet as ‘Fountain’ and many other works ‘Bicycle Wheel’ stands in a corner. Closer to the viewer (because the viewer can directly access 270 degrees of view.) the piece is slightly more removed than some of the others. The curation of this room groups readymades together behind glass, which I instinctively dislike, however, the purpose of the exhibition is not a view of Duchamp but a relational conversation between him and Dali, and so the display can be rationalised in this sense. The single most emotive piece in this exhibition, for me, was not an artwork but a note. In the final room of the exhibition, the viewers walk in to see the piece ‘The bride laid bare by her grooms’. (Dali / Duchamp, 2017) The piece is a large sheet of glass which Duchamp spent 8 years planning and painting. The viewer can see through the work (and at first sight another doorway is visible) which questions and confronts the viewer with the space of the work and its situation. There are many who argue that the idea is the important factor in an artist's work, and just as many who argue that it is the process that is important. Whichever is true, this note remains important, and for me was as interesting as seeing some of the works in the exhibition. Seeing the work of someone as famous as Dali or Duchamp is often a game of recognition, we see a work in person and remember where we have seen it in reproduction. One of the pronounced effects of seeing a work in person is the knowledge that it is ‘authentic’ or ‘original’ or somehow more ‘real’ than seeing it reproduced. 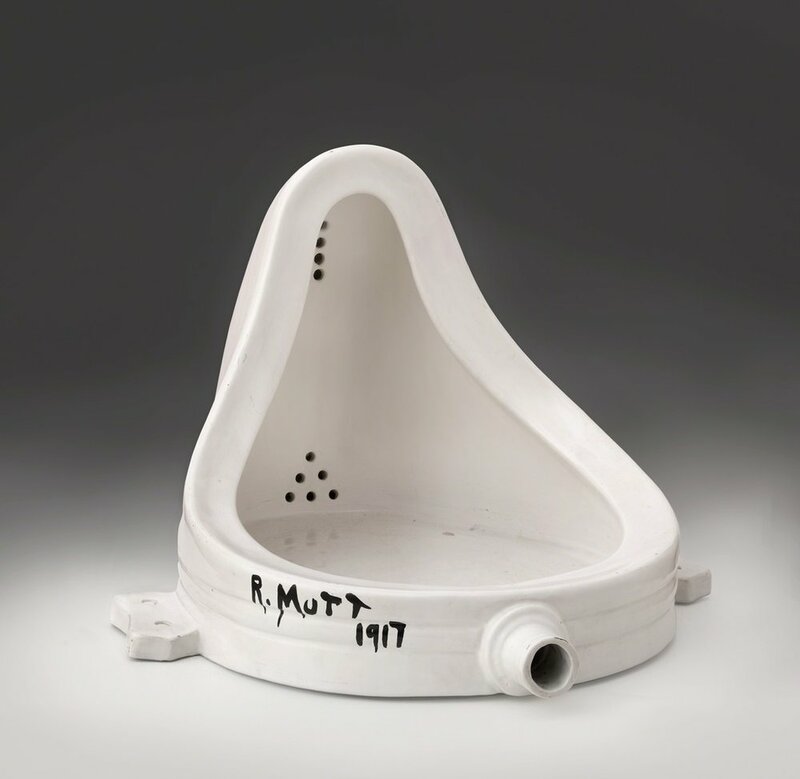 I would argue that seeing the note by Duchamp has the same ephemeral quality, and given its inclusion in the exhibition it must be a common thought. Two of the most impressive parts of the visit to the RA had nothing to do with the work being shown, and everything to do with space itself. The building is steeped in history, and everything about it gives visual signs to that effect. Gold and plaster details line the walls and space is preserved and combined with modern elements. Walking up the main staircase there are two large bare sections of wall, one either side of the stairs. There is a small plaque on the left side, up another section of stairs, that explains that some work has been removed during the redevelopment of parts of the building (the assumption being that this is to protect the works) the works are due to return in 2018. Accompanying text explains that the revealed walls date back to the original Burlington building from the 17th and 18th century. The juxtaposition of unrestored, raw, brick wall against the expertly finished presentational walls of the RA is utterly beautiful. These hidden walls are artworks in their own right, and I am extremely glad that I visited the RA while they were on show. Walking up the grand staircase to see these beautiful things, made me (and I hope others) question whether it was an intentional ‘artwork’. Part of me hopes that some people see the small text set up the next stairs and assume that they are. Of all artworks in the RA there is one that is more prevalent than any other, it is in every exhibition, and remains mostly unseen by visitors. In each of the rooms, there is a small drawing machine in one corner, mounted just above eye height. The primary function of these machines isn't to draw, but a drawing is produced as a result of their process: Seismographs. These small, slightly ‘retro’ looking, machines are functional parts of the gallery, but their inclusion in every exhibition held at the RA combined with their placement on a wall, argues for their nomination as ‘Art’. Photography isn't permitted in the RA, and so I couldn't get a photo of one of these wonderful hidden artworks, and trawling through images on google doesn't seem to yield any results. I endeavour to keep looking. The works therefore become hybrids without leaving their specified medium. This is a wonderful effect, and the misconceptions about material add to the questions that the works invoke. Through the balance of materiality they speak about more than the pictorial illusion that is represented. One of the pieces balanced the misconception well through a small gap between the fields of colour on the surface, through which the paper, and initial pencil marks, are visible. I particularly enjoyed this feature and it was one that drew more of an interaction; I got closer to the work to explore the small gap. Gary Hume (2017) 'Mum'. Spruth Magers Gallery, London. This gallery was showing work by Sherrie Levine (see blog post ‘authorship’ for a bit more about her work). The first piece is ‘from Van Gogh’ a series of modular painted panels. Each panel is painted in a single flat colour, taken from Van Gogh’s original. The resulting twelve panels are hung equidistant horizontally. They are the only piece in this room and demand focus. Adjoining the first room are two gold sculptures and twelve glass covered pieces. In this room, I was struck by the reflection of the sculptures in the glass on the other works. I couldn't say if this was an intentional effect but it was nonetheless an interesting one, and one I plan to use in my work. Like the RA this gallery had a small, functional, visual quirk. At the base of each wall was a small, but wide, recess. I lacked the guts to bend down in the gallery to see what was inside the recesses, something I now regret, but when talking to tutors about it later we concluded that they are for ventilation. I'll admit I became slightly obsessed with these functional interactions with the space, necessary because it is an art gallery. Sherrie Levine (2017) Exhibition Shot. David Zwirner Gallery, London. The work in this show was an eclectic mix by the same artist, which was a brilliant example of the varied practice an artist can have. Through a separate door of the gallery is an installation that reproduces a small shop, complete with working cash register and staff. The artist has gathered real products, and then removed all of the product, before resealing the packaging to place it on the shelves. Thousands of psudeo-products are for sale in the ‘shop’ for the same price as their original. I was, and still am, in awe of this piece. It questions capitalist society, our desire to ‘own’ things and the advertising industry in an experiential way that is accessible if only due to price. 'Zhongguo' (2017) Exhibition Shot. Sadie Coles Gallery, London. Contemporary Galleries - other points. These galleries were carefully presented, in addition to curation. This included, in some, the repainting of the gallery walls to produce the most effective experience for viewing the works. The main thing to strike me about these careful presentations were the empty walls. Emphasis was placed on a few pieces, occasionally a single piece in a large space. I note this most because of my tendency to over-fill. Redaction is an important idea this year. With the exception of the Sadie Coles gallery the spaces were split between relatively small rooms, with the artworks having no extra information that could compete with the contemplation of the works. This extra information can be obtained through guides and price lists. Which are admittedly helpful for remembering the exhibition. Entrance to most of the galleries was via buzzer, and the spaces were quiet and still. Ally McGinn (2017) Installation in progress. London. I cannot remember which of the galleries this image was taken from, I believe it was Spruth Magers, but I'm not 100% on that. However, I was struck by the process of protecting the base of this work - a foam brick. I'm sure I can make use of that in my studio practice. Something that we were encouraged to pay attention to was the differences between the curation and settings in commercial/contemporary galleries and the exhibitions at the RA. While the more contemporary galleries are more relevant to our own practices, and how we might want to display the work or situate ourselves, I noticed another difference that might work with the subject of my work. In the RA all works were shown with relevant information, often including contextual information. Each room was accompanied by a short piece of text displayed on the wall. While not all visitors stopped to read these words, many did, and the majority of those did so before looking at the work. Each thematic text worked to situate the work in the viewer's mind, or at least situate the artist at the time the work was made. The viewers were then contextually primed to look at the work and understand what the artist intended. Whether they agree/disagree/like/hate/understand/misinterpret, or form any other opinion, or simply move past - the information is available and presented with the work. An obvious reason for this presentation/inclusion of information is that these are retrospective exhibitions. These are artists we already consider masters, and we care about the meaning of the work because it has achieved validation. However the important point for me was the way this work was shown, and i am going to experiment with this dynamic in my studio work. The inclusion of notes and preliminary sketches is another marked difference in the RA. We are interested in how these masterpieces were made, and so the evidence of making is carefully curated (especially in the case of Matisse) to reflect that interest. In the commercial galleries, there were no titles or names. Visitors have to collect information sheets, and press releases, to gather the information they need. This could be argued to be a clearer experience, but I was drawn to the RA more, simply because there is no possibility of buying the works. The art market is a vital symbiote of the art world, and I note again here that my interest in this contrast is in terms of subject rather than presentation, but there is an element of purity in the rise beyond commercialism in the RA. So I suppose one way to explain my dual interests here is a preference to the RAs curatorial method in the subject in my work, and a study of the curatorial method of other galleries in the presentation of my work. Ally McGinn (2017) Thames view, London. Walking around London - a personal reflection. London makes me nervous, it always has and I have previously struggled with spending time in London, which has had a massive impact on my ability and experience with exhibition visits. With this in mind, I attempted to perceive London differently from the outset. I had a few hours before meeting the others at the RA, which I spent walking around, ending up in Hyde Park. We then walked from the RA around all the other galleries we visited. I spent the Saturday walking more. Experiencing London in this way, often walking without a particular destination in mind (inspired by the idea of the flaneur) made me view the city in a very different light. I cannot currently articulate what that experience means, and part of the perspective shift I have felt leads me to realize that I don’t have to, at least for now, in this document. This is not an academic observation, but a very personal one. I have been struggling since starting the MA, which is to be expected to some degree. I am an obsessive, self-driven and passionate person, which often manifests in an overwhelming sense of pressure – which stunts creativity and the work being made. I have found it difficult to break from this sense of pressure (which was comparable to the pressure at the end of the BA) and this trip was the first time I have felt free of it. The combination of exhibitions (RA and contemporary), observations (of the space and my interactions with it) and freedom to wander worked together to form an experience I couldn’t quantify or separate. This document is an attempt to mark the moment, begin deconstructing the individual elements and examine the experiential whole. Dali / Duchamp (2017) [Exhibition]. Royal Academy, London. 7 October 2017 - 3 January 2018. Gary Hume : Mum (2017) [Exhibition]. Spruth Magers Gallery, London. 30 September - 23 December 2017. Matisse in the Studio (2017) [Exhibition]. Royal Academy, London. 5 August - 12 November 2017. Sherrie Levine : Pie Town (2017) [Exhibition]. David Zwirner Gallery, London. 4 October - 18 November 2017. XUZHEN Supermarket (2007/2017) (2017) [Exhibition]. Sadie Coles Gallery, London. 21 September - 4 November 2017. Zhongguo 2185 (2017) [Exhibition]. Sadie Coles Gallery, London. 21 September - 4 November 2017. Duchamp, M (….) ‘The Richard Mutt Case’. In: Harrison, C and Wood, P. eds. Art in Theory:1900-2000 An Anthology of Changing Ideas. Blackwell: 252.